john4jack (Corvallis, Oregon, United States) on 15 March 2010 in Transportation and Portfolio. I first did a one photograph HDR in Photomatix with this shot and then converted it in Silver Efex. SABBATICAL - For personal reasons, I am taking a sabbatical from Aminus 3, effective immediately. I have photographs in the system to post through March 18. I wish you joy in your personal and photographic journeys. This is the train you are going to take? :)) Happy sabbatical John! Beautiful and nostalgic shot. Great work ! Really beautiful tones, and true what Irene says, very nostalgic. This is very appealing. All the elements are there for a superb image! 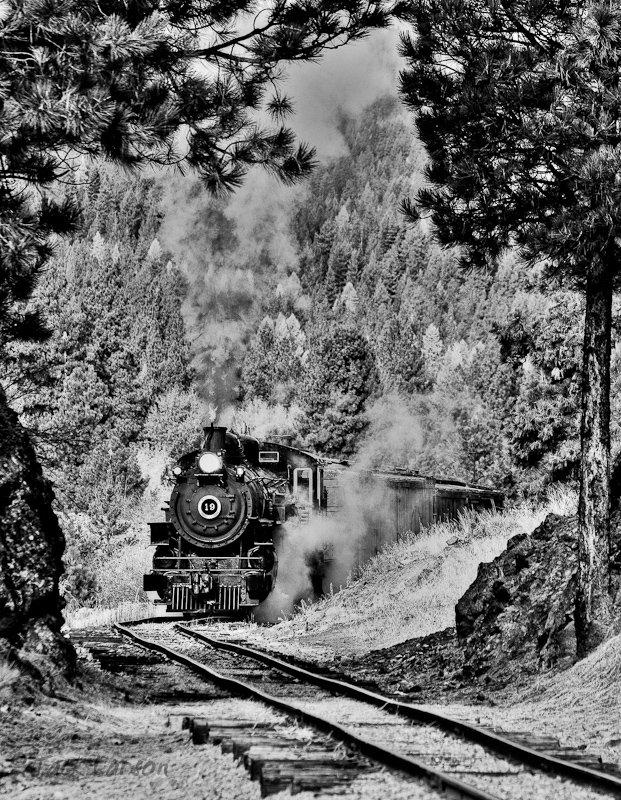 The smoke of the train rounding the bend and the rich vegetation! Luminous and perfect! A wonderful image. A powerful machine, the 19th, I remember perfectly! out of the turn. Some of his body still can not see well. The steam goes for his "whiskers" and the fireplace hard. A tranparent on the forest. the visual impact is provided by a magnificent job in B & W! Fabulous image my friend! Congratulations master Jack! It is with these photos that I discovered your blog, and that this is still very attractive, as another time ! WOW! I love this! Great processing. This has a nostalgic feel to it- great result! Beautiful ! Composition, treatment and the mood are superb ! Love old trains and love your bw Jack ! I´ll just say great shot and have a good AM3 break,hope to see you soon !! Not 100% convinced on the HDR work, but the scene itself and framing are magnificent and packed with detail. this is like a painting. Enjoy your sabbatical and take as long a time as you need; I now limit my online time to one and a half hours maximum per day. What a huge difference it makes! Enjoy. Brilliant composition. Love the B&W in this one. Very cool....I'll have to give that process a go!!! What a fantastic processing on a great raw material! hello. It is in this frame, beautiful lines of vertical and horizontal flight, giving the scale to the photo. I appreciate. This is so good. I love the contrast. Enjoy your sabbatical. Great image and you caught the train perfectly. Contrasty B-W works well here. It looks kind of cool the way the smoke kinda mimic the herd of pine trees and kinda blend in and also the thickness of it on top of the frame which makes it looks like heavy sky. A nice effect to witness. Neat framing and vibrant black & white rendition. Love the light in this smoking & lively image, Jack.